The Lomprayah Catamaran plies a route from near Donsak (50 km from Suratthani) to Nathon in Koh Samui to Thongsala in Koh Phangan to Sairee Beach and Nang Yuan in Koh Tao and then north to its Chumphon pier. The Lomprayah Catamaran is the quickest ferry serving Koh Phangan. It goes from the Tongsala pier opposite the 7-11 convenience store. In Bangkok it starts from the street behind Khao San Road. You can buy Lomprayah tickets at the pier, at its Khao San Road office or any travel agent in Koh Phangan. The journey from Koh Phangan to Bangkok is done in a day; whereas the reverse journey involves spending a night on the bus. For the journey between Koh Phangan and Koh Samui a taxi journey to anywhere in Koh Samui is included in the price of the ticket. This means you avoid the avaricious Koh Samui taxi drivers. Remember that some of the Lomprayah catamaran services run from either Maenam in the north of Koh Samui to Thongsala, while others leave from the main town of Nathon in Koh Samui. Check when you buy tickets. Sometimes Bophut is used rather than Maenam. The two piers are very close together and doesn't effect travel times. Lomprayah have recently done a travel joint ventures with Nok Air and Solar Air. As a result you can buy a combined boat/bus/airplane ticket from Thongsala port to take you all the way to Suvarnabhumi airport in Bangkok. This costs about 3,000 THB and takes about 5 hours. Since the Lomprayah is a catamaran it bounces over the waves. When the Gulf is a bit rough there is often a considerable amount of people suffering from sea sickness, especially just after a full moon party. It is worth checking the Lomprayah website as they sometimes offer discounts for online booking. Seatran goes between the three islands of Koh Samui, Koh Phangan and Koh Tao. The boat is fairly big. The Seatran port in Koh Samui is Bangrak. It's not on the songthaew routes, so unless you have onward transport already organized you need to take a taxi when you arrive in Koh Samui. Seatran have 2 routes. 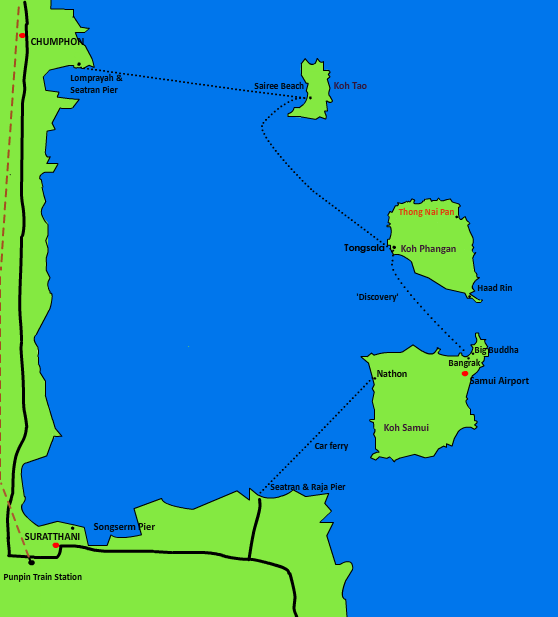 The first is the ferry service that goes back and forth between Donsak and Nathon in Koh Samui. This is a large and comfortable car ferry. There are hourly departures between 0600 and 1900. The other service is the 'Discovery'. This is the Seatran timetable above. It goes between the islands and is a useful service. As mentioned, the Seatran Discovery goes to Bangrak near Big Buddha in Koh Samui. It is possible to buy combined tickets in Suratthani to take Seatran all the way to Thongsala in Koh Phangan. This involves a transfer from Nathon pier in Koh Samui to Bangrak. If you want to travel on from Mae Haad / Sairee Beach in Koh Tao to Chumphorn then you need to check the Seatran schedule. The Seatran between Chumporn and Koh Tao goes once a day. It sets sail at 0700 and arrives at 0900. 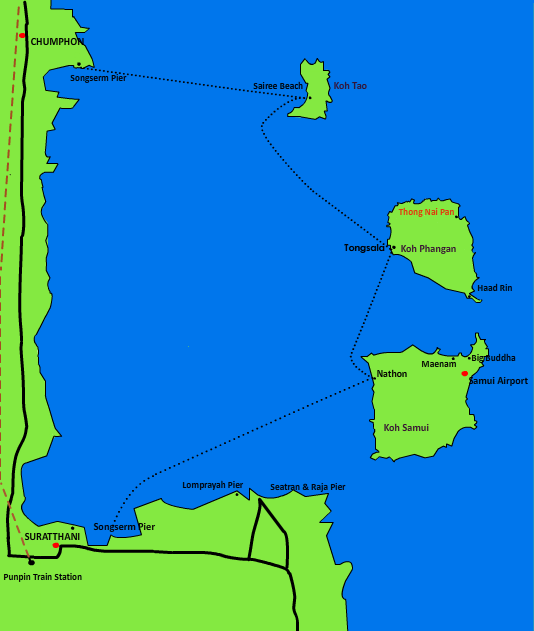 In the opposite direction the Seatran boat leaves Koh Tao at 1600 and arrives at the mainland at 1800. The 'Discovery' boat is much smaller than the ferry but it is still fairly large and is as comfortable as the Lomprayah, though not as fast. The Songserm is a smaller boat and can rock and roll in bad weather. However, it's cheap. The cheapest bus/boat tickets from Bangkok invariably use the Songserm Express. Tickets from Khao San Road to Koh Phangan can cost as little as 700 thb. However, the combined travel time is 2 hours more than the Lomprayah combined bus/ boat ticket. Moeover, several thefts have been reported on the bus between Bangkok and Suratthani. The thieves go through the main luggage stashed in the hold during the night. The Songserm ferry stops at Nathon in Koh Samui. Nathon is the administrative capital of the island and is miles away from the main resort areas and the airport. People embark/disembark from Nathon because either the timing is convenient or they have to go to the immigration office to renew their visa.